How Much is the Penalty for Not Having Insurance? 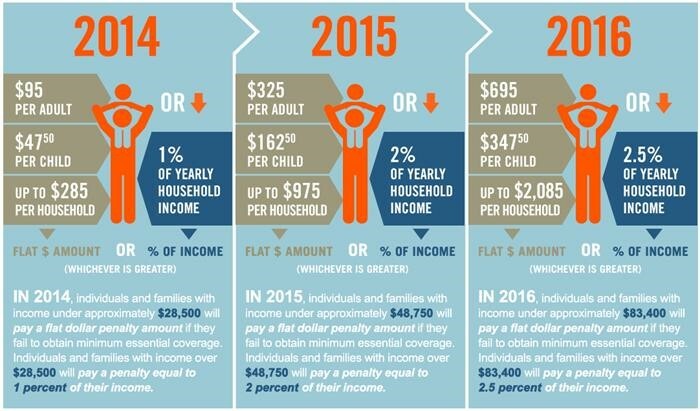 The fee for not having insurance in 2014 is $95 per adult and $47.50 per child (up to $285 for a family) or 1% of your taxable income, whichever is greater. See the “How the ObamaCare Tax Penalty Works” section below for important details as the specifics of the law or more complicated than that. NOTE: The maximum penalty cannot exceed the national average yearly premium for a bronze plan. Also not the fee is 1/12 of the total fee, per household member, for each month they go without coverage. According to the CBO: Almost 90% of the 30 plus million Americans without insurance will not pay the penalty for not having insurance in 2016, mostly due to exemptions. 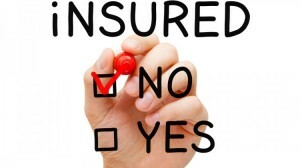 The mandate to have insurance for 2014 is sometimes referred to as the ObamaCare tax penalty, the individual mandate, or individual shared responsibility fee. These are all the same thing. If you are looking for information on the employer shared responsibility fee (the one where employers have to cover full-time workers), please see our employer mandate page.